We have used the colourful Dovecraft Back to Basics Bright Spark collection for our birthday cards with its cheerful colour palette, perfect for all ages! 1. Cut six different Dovecraft Bright Spark papers to 6cm x 8cm. Add a piece of double sided tape to the back of the paper and roll around pencil to create a tube. Cut 1.5cm piece of twine and stick to the top of each paper candle at the back of the paper. 2. We have then stuck a green doily to the bottom of the blue card blank and glued the candles on top. 3. 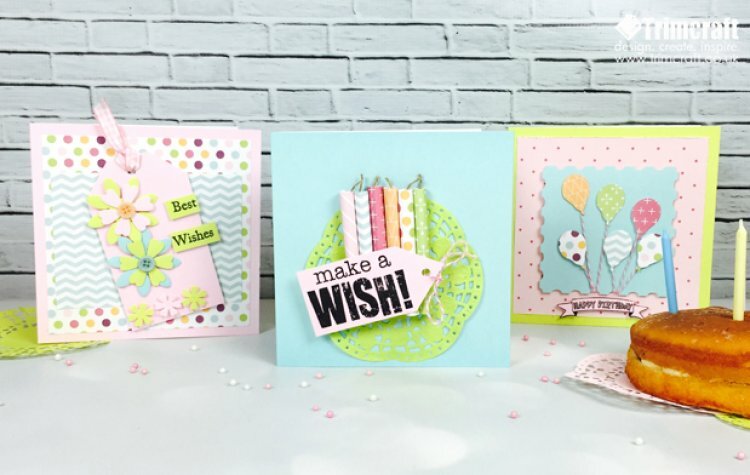 Stamp the ‘Make a Wish!’ sentiment onto a pink card blank. Once dry, cut the card to 9cm x 4.4cm and cut a point on one side to create a tag. Punch a hole on the point and feed some twine through the hole and make a bow. Stick onto the bottom of paper candles at an angle. 1. Cut a piece of the pink polka paper into a 13.7cm square and distress the edges before sticking to the centre of the yellow card blank. 2. Die cut the second largest nesting stamp with a blue card blank. 3. We have then used the Belle and Boo balloon die to cut out six balloons using coordinating papers. Stick pieces of twine to the back of each balloon and stick the balloons onto the nesting stamp at varying heights. We have used double sided tape for the top balloons and foam squares for the bottoms layer of balloons to add depth to the card. Wrap the twine around the back of the nesting stamp and secure with tape. Add foam tape to the bottom of the nesting die stamp and stick to the centre of the card. 4. To finish, stamp the ‘Happy Birthday’ sentiment onto a pink card blank and cut to size and stick to the bottom of the card. 1. Cut the multi-coloured spotted paper into 13.7cm square and stick to the centre of the pink card blank. 2. We have cut a piece of the chevron paper to 12.5cm x 9.5cm and added to the centre of the card. 3. Cut a pink card blank to 6.8cm x 12cm and cut a tag shape on one side. Punch a hole at the top and feed a piece of ribbon through it and tie into a knot. 4. Stamp the ‘best wishes’ sentiment onto contrasting paper. Once dry, cut the words out separately and stick to the right side of the tag. 5. We have added further detail to the card by die cutting two large flowers and layered with two medium sized flowers with foam squares. Decorate the paper flowers by adding a button in the centre and stick to left side of the tag. To finish, die cut two small flowers with some yellow paper and die cut another flower in pink and add to the bottom of the tag from the left side using foam squares. Made any birthday cards recently? Remember to upload and share them in the project gallery!